Four thousand seven hundred ninety-nine miles away from me, at the Engineer Pub in London, "pumpkin balls" are being prepped for Halloween cocktails. This brilliant image shown here came via twitter, with the tease, "Making pumpkin balls for Halloween..." I replied hoping for more information, and got a quick response adding, "@antlerhandler mango bellini cocktails with 'spherefied' mango to celebrate the night of the wicked and weird!" Spherification has been a hot topic in the high tech cooking circles over the last couple of years. Seattle has been the epicenter of some of the experimentation that has been taken place. 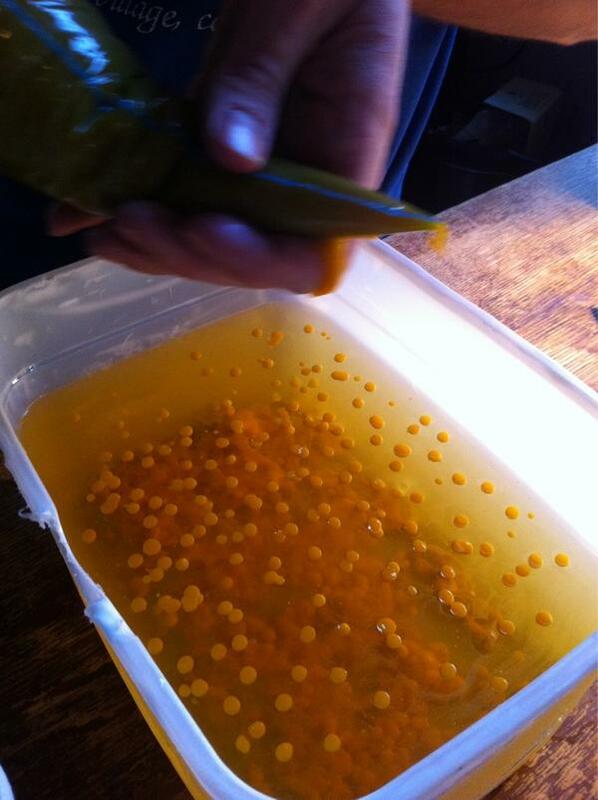 I've been meaning to experiment with spherification but hadn't made it there yet. Seeing this picture provides some great incentive. Update: This just in.... Here is the cocktail with the pumpkin balls. If you've gone to the trouble of making your own pumpkin liqueur, the final step is to bottle and label it. I've tried a few variations over the years and here is my latest effort. The bottles, label paper, and shrinkwrap caps all came from a local brewing supply company, and I designed the labels and printed them on a basic inkjet printer. The labels are easy, they can be laid out in most any word processing program and printed to the special label paper which has a water soluble glue on one side. Cut, wet, and place the labels being careful not to get the ink damp, as it can bleed or run. I also put small labels on the back with my recipe notes for the particular bottling as I'm always experimenting and refining the recipe. Filtering of your pumpkin liqueur is the hardest part to achieve a professional looking product. Even after extensive filtering, you'll likely find a layer of sediment at the bottom of your bottles after a period of time. The final touch that really makes them look pro, is to add a shrinkwrap sealing cap. These are the same caps used on wine bottles and they come in a variety of colors. Just slide them on and shrink them (carefully) with a heat source, such as a heat gun, hair dryer, propane torch, or even your stove top. I just learned something new about cocktails today while reading a book about bitters. It seems that for a drink to be called a cocktail, it must have bitters as one of the ingredients. And while this particular drink may not be my overall favorite Halloween drink (hard to beat the pumpkin martinis), it is my new favorite Halloween cocktail. I've already blogged about this particular drink in a previous post which has a video by local bartending guru Jamie Boudreau. 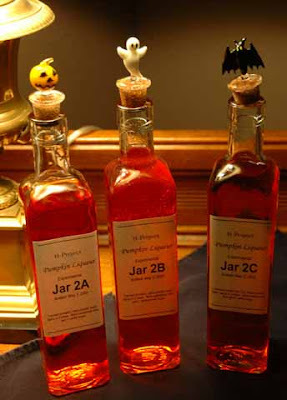 In his video, he shows how to make a pumpkin beer liqueur, followed by the Pumpkin King Cocktail, which uses the pumpkin beer liqueur as an ingredient. I've experimented with this drink in several variations now so I'd thought I post the recipe directly with some minor variations. 1/2 oz. Pumpkin Beer Liqueur (Jamie used the liqueur he made in the video which is excellent, I used my own homemade pumpkin liqueur) If you use mine, increase the amount closer to 1 oz. Jamie's is very sweet in comparison to mine, so use a little more. Dash of Bitter Truth Aromatic Bitters. I couldn't find this locally, but I found Bittermens Elemakule Tiki Bitters, which sounds similar and smells and tastes amazing! More like Halloween than the Island spices it wants to be. I preferred two dashes, though don't go any further, it is definitely bitter if overdone. Add ice to a cocktail shaker, add the whisky, lime juice, bitters, and pumpkin liqueur. Shake well. strain into an ice filled collins glass, then top up the glass with ginger beer. Stir and garnish with a lime slice. That's it, but I suggest watching the video to see the master at work. This drink is an amazing fall cocktail. Its flavor is rich and unique, but its complexity is what makes it so fascinating. I found myself flinching at the thought of lime as I watched the video, but it works really well. And I'm now a new-found bitters fan. There will be more to come on the topic of bitters. This drink still needs one thing in my humble opinion, a proper Halloween garnish -- the bane of so many Halloween Drinks. Once again, I'll have my eye out for a proper garnish for this one. Original cocktail recipe and video via Jamie Boudreau. Bravo! Halloween is quickly approaching so it is time to start your batch of pumpkin liqueur. 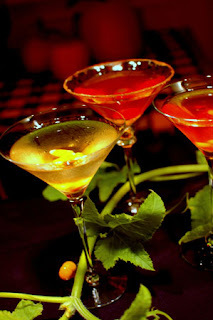 We've got two recipes here on HalloweenDrinks.net, the original slow steep method, and the new one-hour pumpkin liqueur. The original slow method has the most complexity and nuances in the flavor, but the one-hour is still terrific and you can be sipping a pumpkin martini by tonight. So pick the version that is right for you. The best pumpkin martinis in the world, need world class garnish. I've struggled to come up with garnish that complements the coveted pumpkin martini both visually and taste-wise. I've seen the tapioca pearls in some Halloween drinks and they can be quite dramatic, but I'd never had so much as a bubble tea and had no idea what to expect. So I headed off to our local Uwajimaya Asian grocery store and picked up some tapioca pearls to test out. I picked up three varieties, "black", "black sugar", and a mixed color. There wasn't a lot of descriptive text on the packaging, it was mostly what you see is what you get. I like the black in contrast to the pumpkin liqueur and while I haven't tasted all of them yet, I think the two black types may be very similar, they are in appearance after being boiled. They are very simple to prepare, they just need boiling for 5-10 minutes and they are ready to go. They have the consistency of gummy worms but not much flavor. They do tend to pick up the flavor of whatever they are in, so I'm testing soaking them in pumpkin liqueur to see how they taste. They are very Halloween, but I think this martini needs a proper Halloween name. Hmmm? 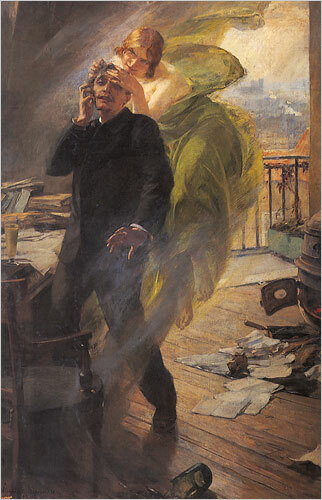 Absinthe has a long history and such a unique mystique. It seems only fitting that a potion known as the Green Fairy would have a place of honor on any Halloween bartender's bar shelf. Gin, Cointreau, Lillet, lemon, and of course, absinthe.